Connecting businesses to top international talent. TPRC wasn’t capturing leads from visitors. Having a website that doesn’t truly represent who you are, and the great work you do never feels good. It’s even worse when you know it’s costing you leads and sales. This was the case for The Philippines Recruitment Company (TPRC). 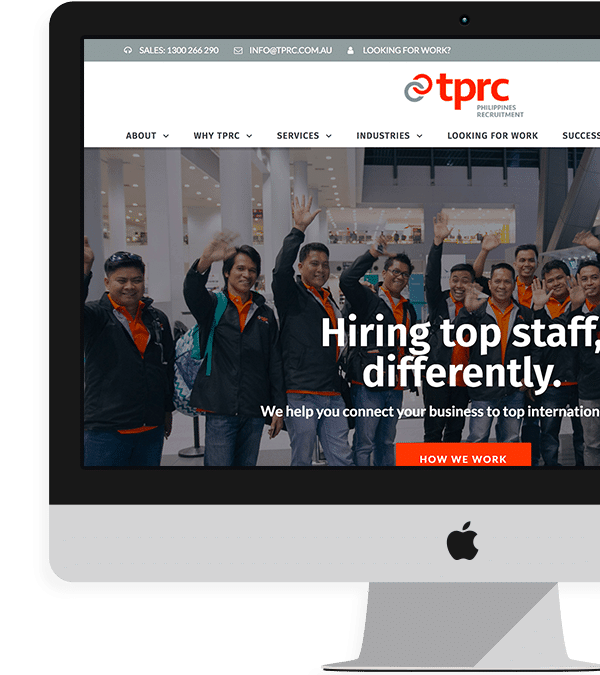 TPRC is a family business based in Perth, Western Australia that helps businesses Australia wide solve their long-term staffing needs by connecting them with top international talent. TPRC’s existing website was well below par aesthetically, and it wasn’t clear what service the company offered and who it was targeting. The website wasn’t mobile responsive and site traffic was low. TPRC wasn’t capturing leads from visitors and there was no clear strategy for generating leads. While TPRC was clearly doing great things with clients that knew them already, its message wasn’t getting through clearly to the people that didn’t know them…but needed them. CEO Greg Holmsen recognised TPRC was not representing its services or its brand in the right way. Davies BDM were fantastic for TPRC. From the moment I met Shane and his team I knew they would capture our message. Shane was able to interpret our purpose into something that jumps out at you when you look at our website. We are now getting very different engagement with our clients, they understand who we are before we even meet. One client called to say they had checked us and the competition out and have decided to go with us. This is our largest ever client – all from our website. We worked on the brand and built a new website. Through a series of workshops, Davies BDM worked with husband and wife team Greg Holmsen and Anna-Marie Wilson to define the TPRC brand and align their own clear values-based approach within the brand strategy for the business. Getting the brand right is a critical first step and the foundation of producing a website that works. We worked with TPRC to define the business’s core idea and aspirations before looking at its personality and how it should be communicated to the world. We undertook a competitor review and developed a brand positioning strategy that clearly positioned TPRC against its competitors. With the TPRC brand clearly established, we set about clearly identifying the markets it services and redefining its service strategy, including Greg’s educational speaking, consulting services and a partner offering, which were not previously communicated as services. We built on the brand work by doing a deep dive on TPRC’s buyer personas, a critical step to ensure the website copy and images connect with the target buyers – Australian businesses looking for top talent. TPRC’s values are incredibly important to its entire team and the website needed to reflect this. We also ensured that TPRC’s family values approach to business were clearly communicated through the use of the Family owned Australian Business Emblem provided through membership of Family Business Australia. Getting the brand and messaging clear allowed Davies’s BDM’s copywriters to develop a message that connected with web visitors and truthfully represented TPRC’s services, people and values. 250% growth in website visitors. 150% in lead numbers. Within 6 months website traffic was up 300% and leads by 125%. With a revised website design, mobile responsiveness, clear messaging, SEO copywriting and contemporary branding, TPRC’s website is now bringing in more traffic and its forms and landing pages are bringing in more leads.